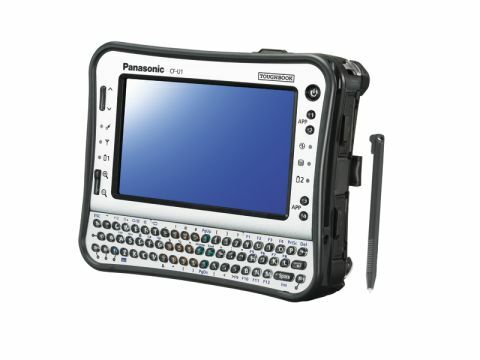 Is Panasonic's Toughbook CF-U1 top of the knocks? The Toughbook CF-U1 is referred to as 'extremely rugged', which puts it in Panasonic's top knock-taking category. Thanks to its diminutive proportions and solid state disk, this UMPC (ultra-mobile PC) can withstand a drop from 1.2m. It's also fitted with hatches over the various connectors and slots which means it's waterproof to IP54. In common with most UMPCs, it doesn't boast the same high specification as a business laptop, but it's more than adequate for its intended purpose. It has a 1.33GHz Atom processor and 1GB of RAM, and its SSD has a capacity of 16GB. At just over 1kg it's surprisingly light, and the nine-hour battery life adequately provides for a full day's work in the field. If you want a full-sized laptop then the Toughbook CF-U1 probably won't be for you, but if you can live with the tiny 5.6in touchscreen and the shrunken keyboard, you'll get a seriously tough PC for your money.